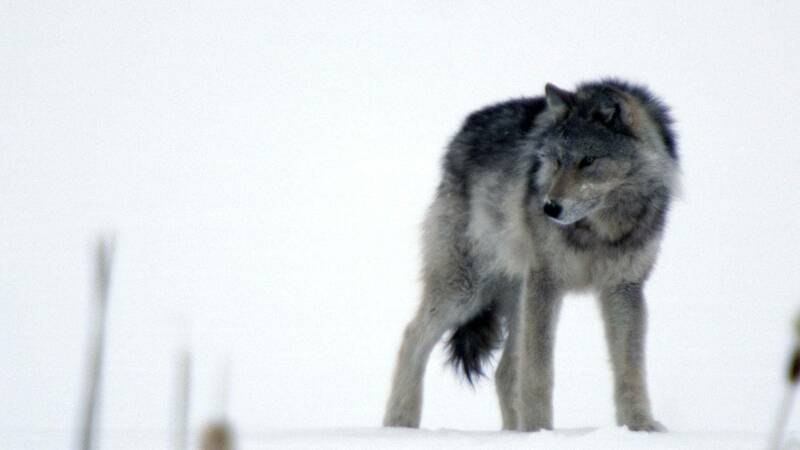 Cold Warriors: Wolves and Buffalo begins in winter when the wolf pack is most visible and working as a cohesive unit, traveling and hunting together. Turner is following an average-sized pack of about eight wolves led by a large alpha male. A wolf pack can best be described as a family with the alpha wolves, the father and mother wolf, being the leaders and most of its members their offspring of various ages. For the pack to survive, its leaders must provide food and security as well as teach their young to hunt buffalo. The goal is to try to kill one every week or so, despite the buffalo’s 20-1 advantage in size over the wolf. Buffalo are ideally suited for winter and so well insulated that snow lying on their massive bodies doesn’t even melt. But the deep snow of winter poses a problem for them when they are being chased by a pack of wolves; the buffalo have to break trail, which tires them faster than their predators. The aerial camera documents the time-honored hunting strategies employed by the wolves and the evasive tactics of the buffalo, which start with the pack trying to get the herd to run so the wolves attack from behind. The buffalo hold their ground and face the wolves in standoffs that can often last for days, but eventually they start running, with the pack in hot pursuit trying to break up the herd. The spring and summer pose more challenges to the pack than to the herd, with an alpha female giving birth to pups who need to be fed and their den defended. This means there are fewer opportunities to roam in search of prey and, sadly, most pups die of starvation at this time. Although the buffalo calves make for easier targets, the mothers are extremely protective of their young and sometimes hide in the forest to make it harder for the wolves to isolate a single calf. If the pups survive and grow bigger, they’ll leave their den in autumn and join the pack as the hunting cycle continues. Turner concludes that the biggest challenge to the wolves is not the strength of their leaders, but whether their ancient habitat will remain remote enough with the Alberta Oil Sands, the world’s third-largest crude oil reserve, directly upstream from Wood Buffalo National Park.